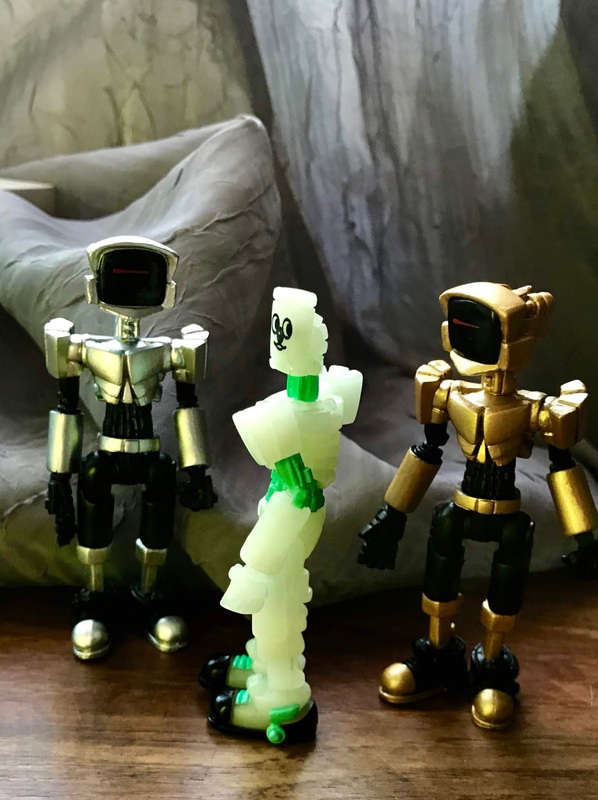 Welcome all to the fifth wave of AV Robots! We have a little bit of something for everyone this time- if you like order and reality, the silver and gold Centurion Order will treat you right. If you like chaos and beings from outside space and time, The Glowing Being will be there for you, welcoming you for fun and games. If you like all that and more, enjoy this set of figures! Special thanks to Mushbuh for designing with me the faces for the new glow figure! Follow at @mushbuh on instagram and twitter. Thank you!! Thank you all who bought stock of Wave 4 of the AV Robots, or who reblogged, liked, or otherwise signal boosted for me! I've been so pleased to see these sell well, and I am excited to have these friendly machines back in production. There are plans, plans for the near future for another wave of robots! Once again we will have multiple styles, and some collaborating has been happening. Stay tuned for more news as we reveal some teasers next month. Thanks again, y'all. I really appreciate all the love I've seen for the return of the robots. I hope you like what's coming next! The newest release, first unveiled for Designer Con is now in the store! Check it out, buy some, and customize them! They are $8 each. The muscle color that some of the glyos sister companies have united to produce for the convention is pretty excellent, and gave me the chance to avoid all paint applications in the name of homaging the original little wrestlers. Also, I have a very very few left of the original orange figures way back from the first release back in the store. If you missed them, now's the chance to pick them up! Anyhow, here is the store link! Enjoy! The action-packed Designer Con is coming up next week! I'll be there, as will most of the Glyos sister-companies. Come meet me! Come meet some of my favorite people in the world! This convention marks the first ever time I will be selling my production figures at a convention booth. It's really very exciting, and I have a couple new figures just for the occasion- crystal clear and muscle-pink! Both are fully unpainted, giving both me and you the chance to make some customs! Whether with paint, dyes, or building, these artificial intelligences in their cold, constructed bodies are just waiting for some creativity. That brings me to my second picture, which is one of a handful of customs I'll have at the table as well. I had to take advantage of that clear plastic to make a monitor that you can stare deep into. After I return from the convention I will put the remaining Clear and Muscle figures on here for sale, so fear not if you can't make it! Thank you everyone! This second drop was a big success, and there are still some robots and comics in the shop, in case anyone wants more. 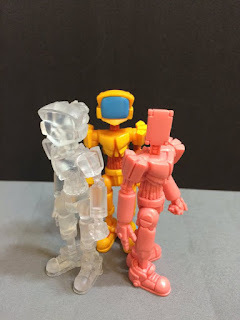 I've been incredibly impressed in the builds people have been doing with these figures so far, I hope you all check out the custom builds on The Glyos Connection! As a thank you, a fan sent me this amazing picture! Sometimes, a picture is way better than I could ever do, and so I am compelled to feature it. Thank you to Nash Thomas! Your creativity is boundless, I hope you continue to show us your customs work!